If you are using the Firefox Browser then you have to be alert from extension, it could cause your internet on the web. How many of you know that extension coming through which way? Here we are going to sort out the problem that ADD-ONS disturbing while you installing extension to support the Firefox Browser. It will cause the browser search engine when you are searching the keywords in Firefox web browser. In the mean time if you like to disable or remove the Add-ons from the browser search engine and move fast into the website. In this formula you can finalize the browser and how to remove or disable the extension for the Firefox Browser. Let’s see how the steps help you control and keep safe from Add-ons. Open your FireFox Browser Search Engine and its look like below image, when you add a new extension into the search engine. It shows like multi toolbars that cause when you are searching keyword processing. 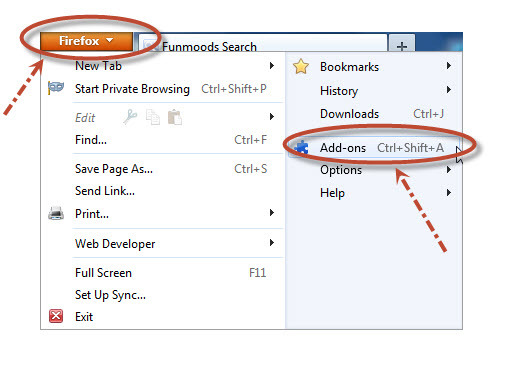 Secondly, see how to enter the Add-ons on FireFox Search engine page to disable or remove the extension from the search engine. you can find top left side it was highlighted like orange color button written FireFox, Just click once drop down menu small mini page will open on the page you can see Add-ons or you can go through with shortcuts (Ctrl+Shift+A). In Add-ons Manager you can find which extension has to remove or disable for temporarily for this you can learn with below image, how to direct the Add-ons. while you are in FireFox search engine.